Painting has started! 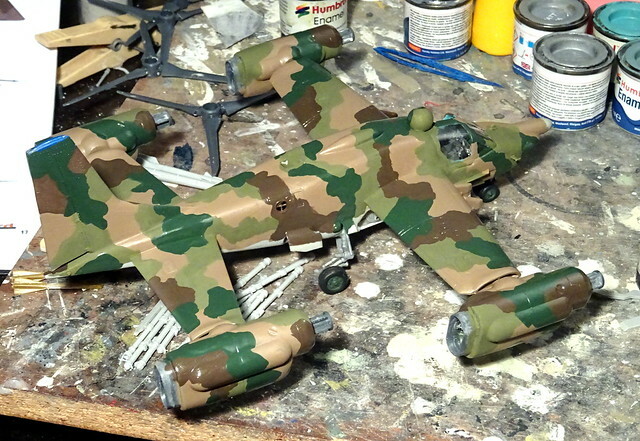 Still fighting with the modified landing gear, though. The beast looks a bit stalky now, but it's O.K.. Very promising! If, like in your last photo, the engine pods could be moved independently, it would offer some "interesting" maneuverability. I wonder if the MV-22 does that now? I doubt it but I really have no idea. Might be quite a digital fly by wire issue. That first pic was very interesting with the bit of blue showing on the tail! Quite a remarkable beastie. 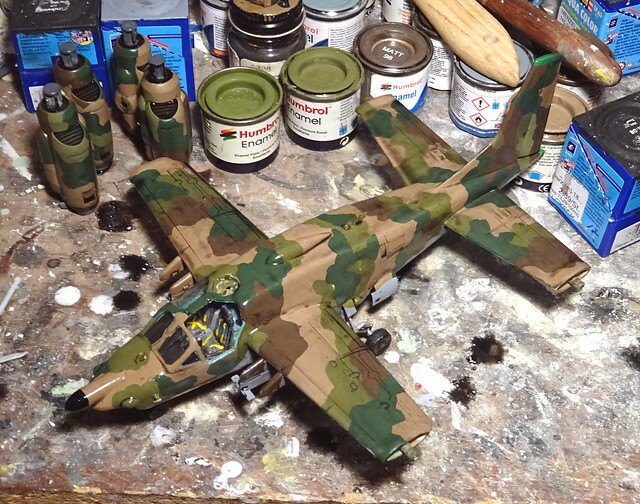 That's camouflaged so well it's difficult to actually SEE it! 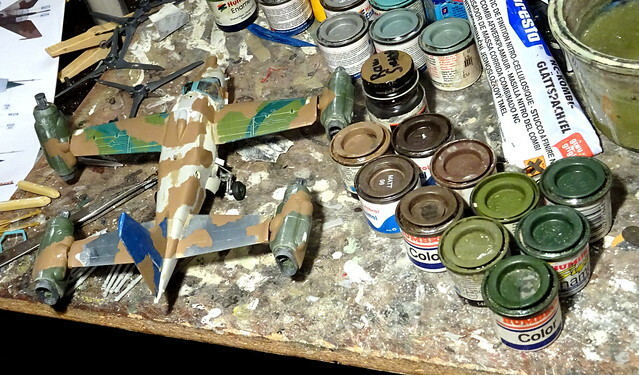 It's because Dizzy has camouflaged also his workbench! 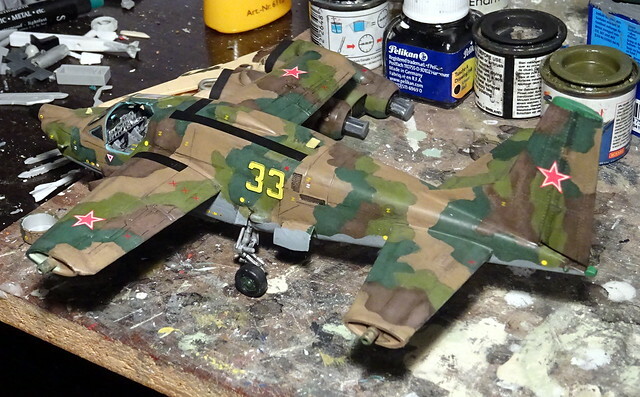 Well, the paint scheme is based on a real MiG-21 from the late Eighties. 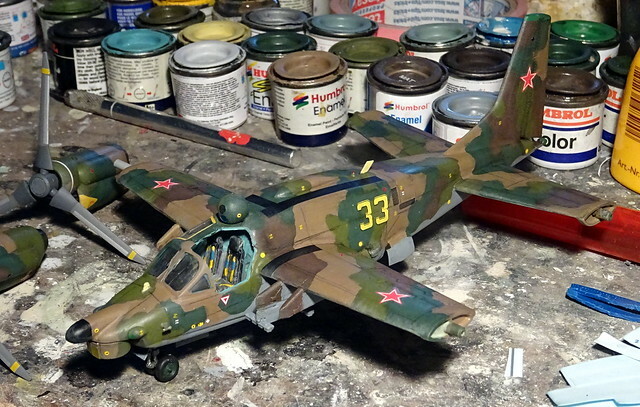 Quite amazing how effective these Soviet four-tone schemes are, it really breaks up the vehicle's outlines and makes details hard to recognize. Not much new to show at the moment, though. 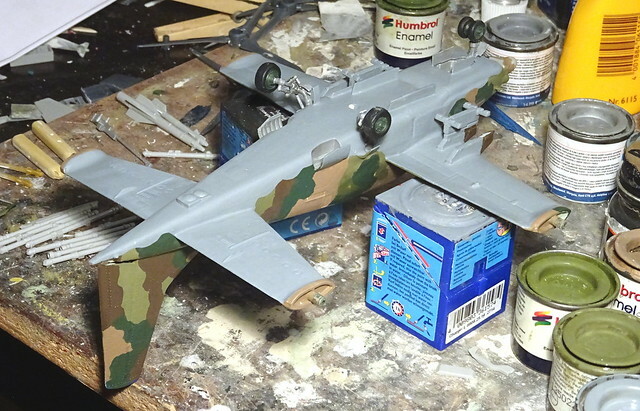 Did some post-shading on the model and spent most time of the weekend with the ordnance and the propellers. Esp. 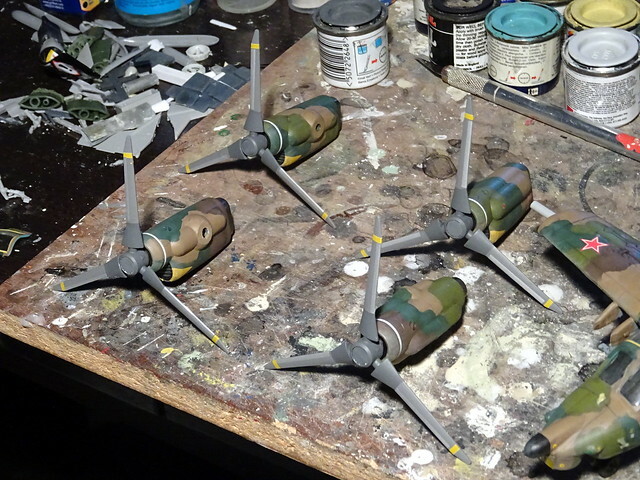 all the missiles that will hang under the thing take lots of time. Decals come next. 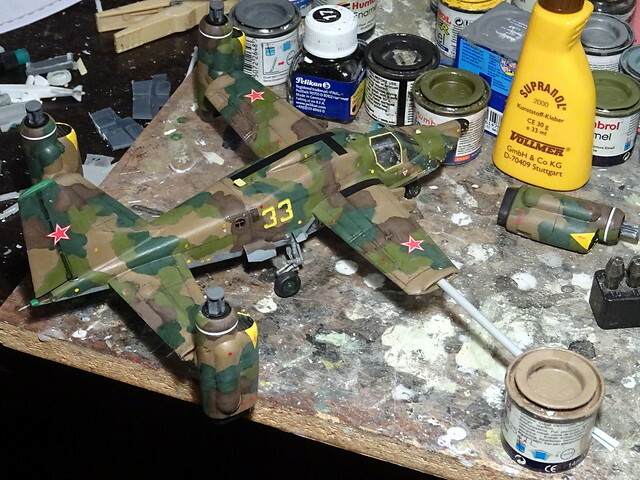 With Soviet markings the Vintoplan looks convincing, I just have to do some more detail work, then I can coat it with varnish. Finishing touches on the way, and (naturally... ) disaster struck when one of the pins that hold the nacelles came off... Had to improvise a prothesis, and it seems to work. 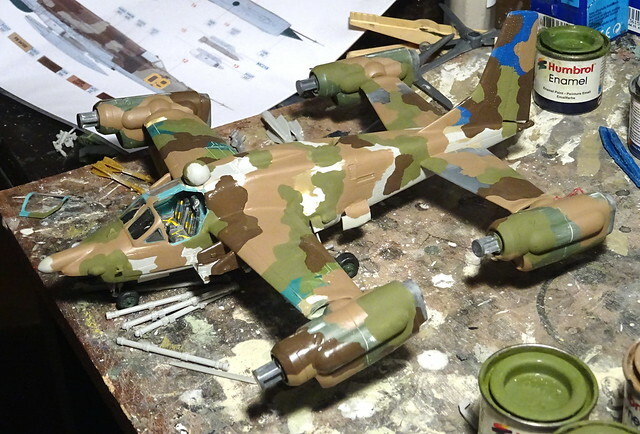 Today is final assembly - esp. 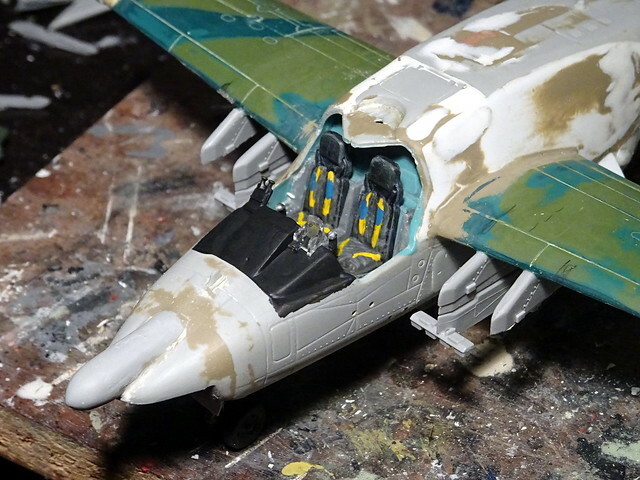 the dozen missiles under the front wings makes me nervous.